At the start of the twentieth century, football was still in its infancy and tended to be followed by supporters who were based in the locality. Few celebrities or famous people of the time would not really be associated with what was seen as a working class sport. 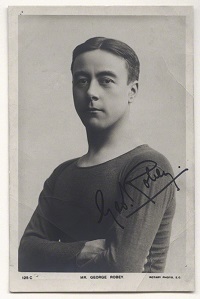 One exception was George Robey, the Music Hall comedian whose sporting prowess led to him playing on the Isle of Dogs for Millwall Football Club. What was extraordinary was that he fitted in playing as well as appearing on the stage. Robey was born in Kennington, London in 1869. His father was a civil engineer who spent much of his career on designing tramlines. In 1880 the family moved to Germany and Robey attended a school in Dresden. At the age of 18, his intention to following his father’s profession was ditched as he became interested in a career on the stage. Gradually his career on the stage developed especially in Pantomime, where his comedy was popular with the audiences and the critics. He also developed a character known as the ‘Prime Minister of Mirth’. 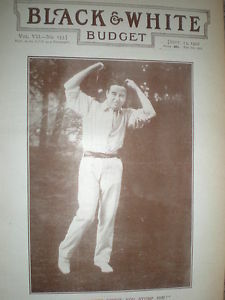 Robey believed in a healthy lifestyle and was a keen amateur sportsman, he had played as an amateur against Chelsea and Fulham football clubs. He also organised and played in many charity football matches all over England. One of the charity matches in 1907 was for Chelsea’s Scottish football trainer James Miller, who had died the previous year. 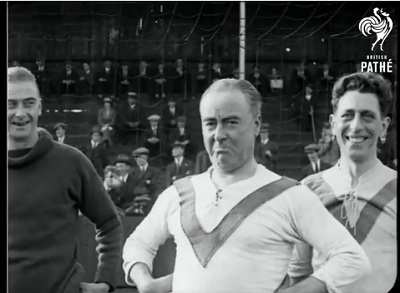 The match raised considerable proceeds for Miller’s widow and Robey began to make jokes about Chelsea which he became famous for over the years. He did not just play for teams in London, as he toured around the provinces he would often ask to play for a local team. In this way he played matches for Glasgow Rangers and Aston Villa. 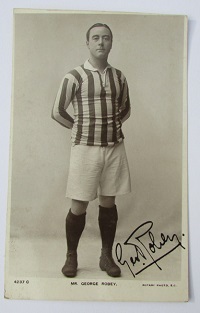 In 1903 Robey was playing at a semi-professional level when he was signed as an inside forward by Millwall Football Club and allegedly scored many goals for them. Just how many times he played for Millwall is difficult to ascertain due to the fact that serious matches were hard to distinguish from the charity matches. Often when organising these charity matches he would ask some of the Millwall players to participate. The period that he did play for them was before the Millwall football club decided to move from the Isle of Dogs to South London in 1910. His memories of these matches indicated that although people thought he was a strong player, he wasn’t always taken seriously, often the crowd would shout out his catchphrases and start to laugh. In one particular incident he was knocked out cold and woke up to find hundreds of people smiling at him, thinking he was pretending and the incident was part of some comedy routine. Robey also became associated with cricket and eventually became involved the MCC and played in a number of minor matches. 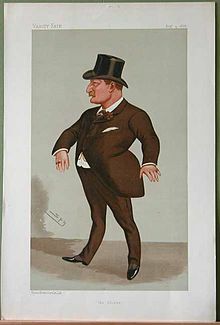 Just before the First World War, the comedian became a favourite of the Royal Family and was hired for several private Royal functions. In the First World War itself , Robey worked as a Special Constable and raised money for charity through his performances as a comedian. 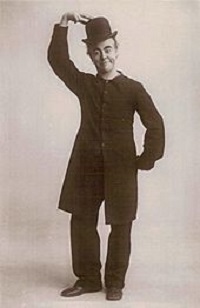 After the war, Music Hall had fallen out of favour with audiences and Robey began to appear in Variety shows and Revues. One of his most famous revues was ‘The Bing Boys Are Here’ where he sang the song “If You Were the Only Girl (In the World) ” with Violet Loraine. In the 1930s, he was successful in a series of Shakespeare roles and made his radio debut in 1936 and his television debut in August 1938. In the Second World War he would perform at hospitals, munition factories, airfields, anti-aircraft posts and troop concerts. In the 1950s, he was in his 80s and came back to East London to opened the Lansbury Lodge home in Poplar. In 1954, he was knighted for his contribution to show business and his charity work. It was estimated he raised 2 million pounds for charities throughout his career. In late 1954, he suffered a stroke and died but was feted as one of Britain’s greatest comedians. Although largely forgotten today, George Robey was one of those extraordinary figures that seemed to excel in almost everything he did. From playing football in muddy Millwall field to making people laugh in the local Music Hall, quite often on the same day. There is little doubt that even in the 21st century, the ‘Prime Minster of Mirth’ deserves greater recognition for all his numerous achievements. Dr Lombard John Newman Tanner was born in Cork, the son of notable surgeon Dr William Kearns Deane-Tanner. 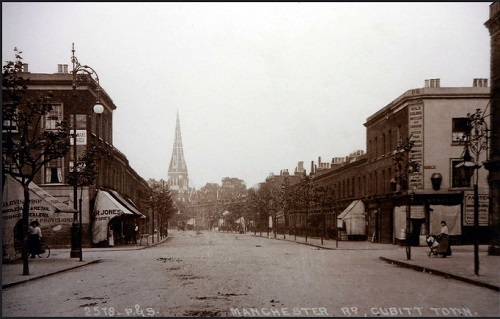 In the early 1890s he moved to 451 Manchester Road, Cubitt Town, to set up a medical practice. For whatever reason he decided to end his life, this tragic event was widely reported in the newspapers due to his brother being a Member of Parliament and because he left an extraordinary suicide note. The following report gives the main details. An Interesting Case of Suicide. Dr Tanner, of Cubitt’s Town, England, committed suicide on April 28th last. At the inquest the following letter, written by the deceased, was read:- 5 April 28th, 1893. I am tired of life, and therefore have made up my mind to die. I think that suicide is quite justifiable, and in strict accordance with all economic laws. I think instead of being made an offence against the law every facility should be given to anyone desirous of ending his life, and of doing it in a comfortable, satisfactory, and painless manner. I have no religion, and abhor so-called Christianity, and therefore beg most earnestly that I may not be buried, but that my body may be sent or taken to any of the schools of medicine for dissection. I think Bradlaugh’s allowing himself to be buried was a mistake, and if by this action of mine I pioneer a movement against such barbarism sanctioned in the name of religion I shall not have lived in vain. We are brought into this world without our consent, and I therefore do not see why we should not leave it when we like. I have intended to do so for the last three months, as my energy is gone, and I cannot battle against the world as I used to. If there be another world, which I very much doubt, then I will take my chance and start afresh. But what I most need is rest. I am so wearied and tired of it all. The few effects I do possess should pay my hotel bill, £8, I owe the Queen’s Head, Theobald’s read, Hayhoe’s bill for drugs, and any small items that may be due by me. I apologise to the proprietors of this hotel if I have caused them any inconvenience, which, indeed, I know I shall: but what can I do? I thought of going to Richmond Park, but it would equally give trouble. I do not want to be selfish, but it is a fault of the State not to give us proper facilities, therefore I must apologise not alone for myself but my country. LOMBARD J. TANNER, late of the National Liberal Club, Whitehall place, and at 451 Manchester Road. Cubitt Town. The Inquest was not without incident, when his brother entered the court. Dr Tanner MP, who seemed much agitated, here entered the court, and was accommodated with a seat. A hypodermic syringe was lying on the dressing table. It was produced. Dr Tanner (interrupting): It is mine. The witness, continuing, stated that there were a number of letters on the mantelpiece. Dr Tanner, M.P. for the Mid-division of Cork, identified the deceased as his brother, who was christened after the Protestant Dean of Cork. He was forty-one years of age. Witness last saw him alive before he went to Ireland prior to the meeting of Parliament. The last time witness saw him alive he bought him a practice in the East- End of London. Witness knew nothing that was pressing upon his mind. He differed from witness politically and also upon religion. The witness identified a letter in his brother’s handwriting which is as follows :—” Dear Charlie,— Goodbye. I shall be no more On the back of the letter were the words “March 3, 1893.—Received the sum of £2 on account of Messrs. Nathan and Co., 27, Chancery- lane, re Willows.” Some minor details having been brought out. Dr. Alfred Withers Green, of Bouverie street, Fleet-street, stated that he was called to the hotel at half-past 5, and found the deceased lying in an easy position. He had been dead about 24 hours. There were two marks of puncture on the left leg, the pupils were contracted, and all the organs were healthy but congested. Death was due to an overdose of morphia , which had been injected. The Coroner, in summing up, left it to the jury either to take the strong view adopted by deceased’s brother, and returned a verdict of felo de se, or to arrive at the opinion that the deceased had committed suicide while temporarily insane. Personally, the Coroner thought the letter which they had heard read was of such an extraordinary and incoherent description that it could only come from a person whose mind was unhinged. Dr Tanner MP again sought to address the Court, but the Coroner entreated him to remain composed. The jury consulted for about five minutes, and agreed to a verdict that Lombard John Newman Tanner died from the effects of morphine poisoning, and that such poison was self administered while he was in an unsound state of mind. This case is extraordinary for many reasons, Dr Lombard Tanner’s plea that the state should allow people to commit suicide and anti religious stance was quite radical at the time and undoubtedly convinced the Coroner that he was mentally unstable despite the pleas of Dr Tanner’s brother. The Coroner description of the letter as a ‘ extraordinary and incoherent’ seemed rather strange considering it seemed quite rational and well thought out. It is also extraordinary that no-one asked what had led the Doctor into this state and why a Doctor from a prestigious Irish medical family should be bought a practice in the East End of London. Despite their differences of opinion over religion and politics, the two brothers were very close. When Dr Tanner’s brother died in 1901 of consumption, he was buried at Kensal Green Cemetery next to the grave of his brother. Unfortunately this was not the only tragedy to affect the family , Dr Lombard Tanner’s nephew William Cunningham Deane-Tanner went to America changed his name to William Desmond Taylor and became a well known film director in early Hollywood. In 1922 he was found murdered in his bungalow, the murderer was never found and the case was considered one of great scandals of Hollywood. At this time of the year, West India Dock has very few ships visiting but still there is always plenty to find interesting. 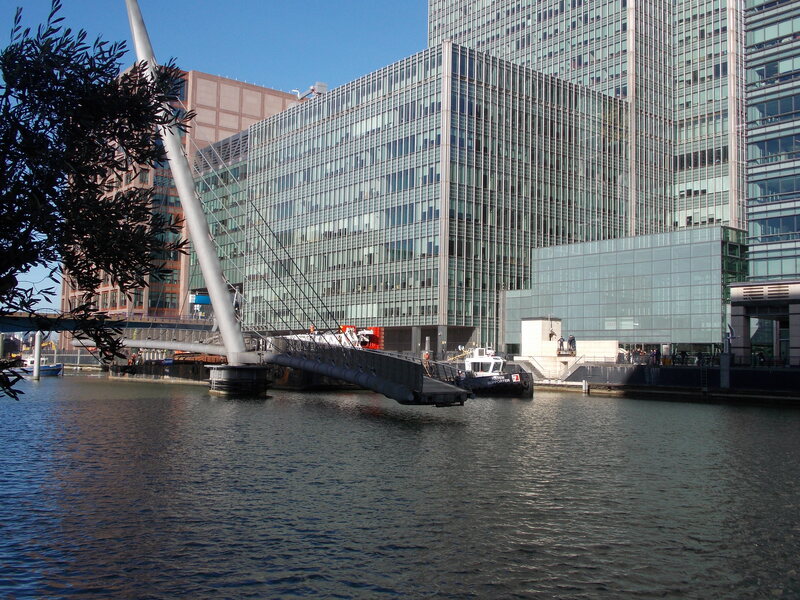 The Canary Wharf Group is pressing ahead with two of their major building projects in Heron Quays and Wood Wharf. 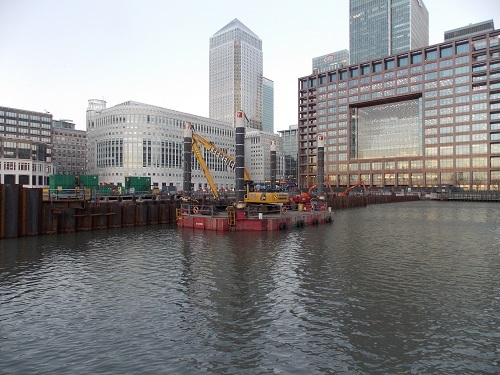 The Heron Quays site in particular has been the focus of considerable activity, interestingly part of the project is virtually on the water and a large number of piles have been driven into the dock. 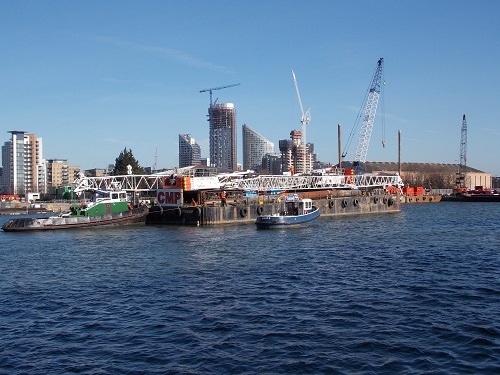 Large cranes on pontoons have also been used and yesterday crowds of people watched as one of these pontoons was moved from Heron Quays to Wood Wharf. 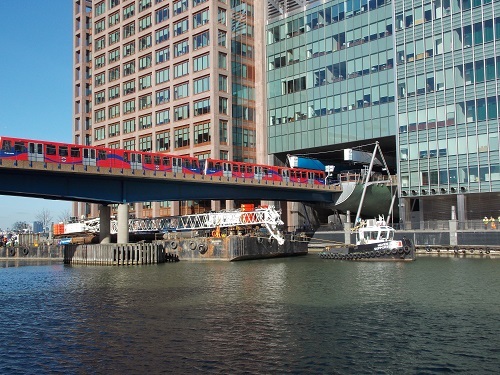 Although it was a tight squeeze under the DLR track, the major disruption was the swing bridge which was out of action for some time. ‘Bridgers’ were a well known hazard of living on the Isle of Dogs as the ships entered the docks. However many of the modern office workers who got stuck on the South Quay side looked distinctly unimpressed by the procedure. As the pontoon was pulled and pushed by tugs into position in Wood Wharf, I took the opportunity to wander past the Will Sailing Barge and down to where the Lord Amory, the Portwey and the Massey Shaw are berthed. 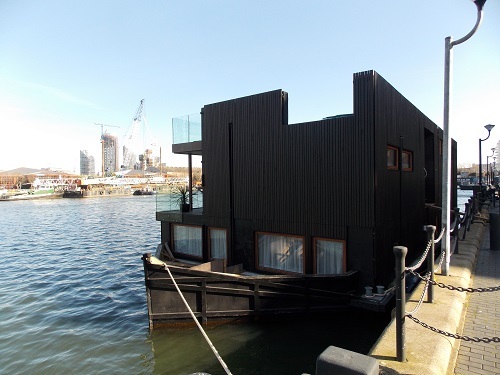 An interesting new addition to the dock is a houseboat with a difference, it is certainly a innovative design the top looks like an apartment placed onto a wide boat base. 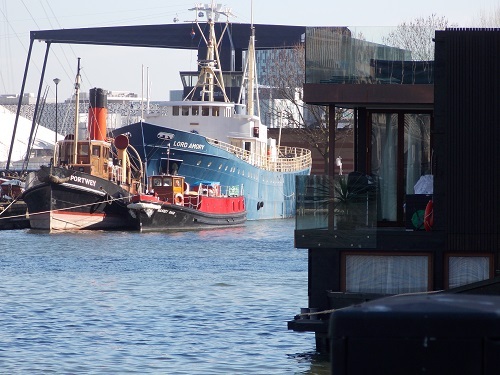 You would certainly get a great view but looks like it would have to be towed from place to place.With house prices rocketing it may offer a more economical approach and represent the modern version of living on a houseboat. 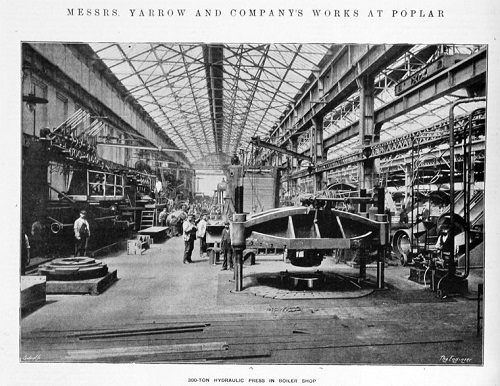 The Isle of Dogs has been the location of many famous shipyards, however the Yarrow’s shipyard was considered one of the most innovative and efficient . 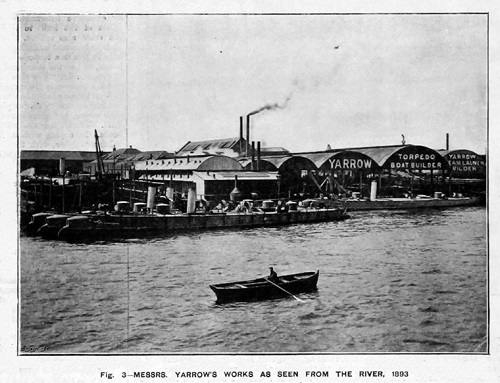 Yarrow’s had started as Yarrow and Hedley at a small site at Folly Wall in 1866, building river boats but progressed to a larger site at London Yard on the east of the Island, they were famous for building a larger variety of small boats and steamers and even Torpedo boats and Destroyers. Many of the boats were built for export especially foreign navies, however by 1908 the London site was closed down and all production moved to Scotland. I recently came across the following newspaper report from the Daily Mail of 1901 which acclaims Yarrow’s business model whilst noting that foreign governments were taking advantage of the company’s expertise whilst the British Government was slow to take advantage of Yarrow’s innovations. In that dismal region of the East End, associated with mean streets and decayed industries, known as the Isle of Dogs, there is one bright spot. At the bend of the river, just opposite Greenwich Hospital, an industrial oasis flourishes on the site of ruined bridge building works, and close to the remains of the once famous shipbuilding yard of Samuda and Co. I refer to the model works of Messrs Yarrow and Co.— perhaps the most international business in the country ; certainly the one which executes work for more Governments of the world than any other. The firm is really Mr A. F. Yarrow, who started the business 30 years ago, and has prospered in a centre were nearly every one else has failed. Not that Mr Yarrow’s is really a great business, in the ordinary sense, judged by the capital employed, or the extent of his works — although his yards cover 11 acres —or the number of his employees (about 1,200) ; but it is great because it is unique and unassailable. He does not fear competition, because he is above it. In the particular department which has won him most fame, Mr. Yarrow has never had a serious competitor, and it is because of this unique position which he occupies that he executes orders for almost all the Governments of the world on practically his own terms. If anyone has an apparently impossible problem to solve in marine engineering, if a new kind of boat is wanted for an unnavigable river, or a steamer which must run at a given rate drawing only 6 in. of water, boats which can use oil or wood as fuel, others which can be taken to pieces for transit by land, and put together again by the unskilled, or, in fact, any new kind of novel craft, then one naturally applies to Mr Yarrow. 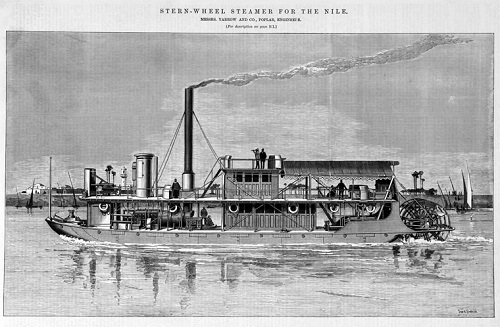 His marvellous ingenuity and inventiveness have enabled him to solve every problem which has been submitted to him, and among all the 1100 vessels which he has built of all sorts and sizes— from ironclads, cruisers, and torpedo-boats to shallow river steamers and little launches — not one has ever been lacking in speed or failing in its requirements. Just now Mr Yarrow has two strange-looking steamers on the stocks for the Government, each with two tunnels running half-way under the keel to accommodate the propellers, as the vessels must be able to move in six inches of water. He has three oil burning torpedo-boats on hand for the Dutch Government, one of which has been launched, and attained a speed of over 26 knots. Two shallow draught gunboats were built for the British Government this year. Each had to bear a load of 40 guns, combined with shallow draught and high speed. These boats are capable of navigating crooked and shallow rivers, and many original and clever devices had to be introduced to accomplish the objects in view, and make the vessels effective as gunboats. It may be remembered that two shallow-draught river gunboats of similar style, built by Messrs Yarrow, played an important part in the bombardment of Khartoum. It Messrs Yarrows’ great innovation in river steamers began with Le Stanley, built to the order of the King of the Belgians for the last Stanley expedition.. It was a stern-wheeler, made in floatable sections, so that it could be taken to pieces and conveyed easily overland to avoid waterfalls, etc. The result of this and other new forms of boats invented by Messrs Yarrow, is that rivers in new countries are now opened up as avenues of trade. 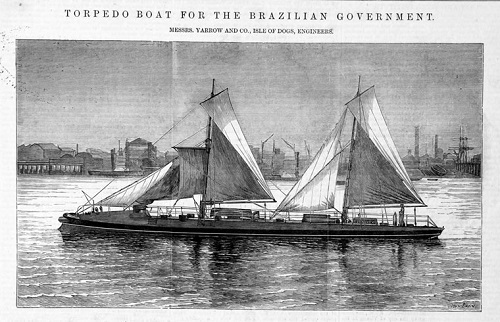 Messrs Yarrow and Co. have supplied torpedo and other boats to every European country— to Japan, China, Chile, Peru, the Argentine, Brazil, Ecuador, and, in fact, to almost every country in the world which has a navy, with the exception of the United States. The firm have had large dealings with Holland, Sweden, and Russia. France has not been a large, or, perhaps a willing, customer, but there were boats wanted which no one could build in France. 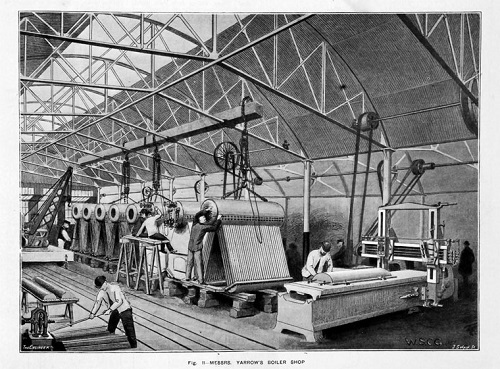 Messrs, Yarrow astonished the French Government once by building a steamer for use in the Tonquin rivers in three weeks, As a rule the foreign Government’s which once patronise the Yarrow yards return, while our own Government in less free with repeat orders, Once the Admiralty has a special design, it puts the work up to competition, and is keener about low price than high quality. One of Mr Yarrow’s inventions is a water-tube boiler which has been largely used by Continental Governments, and was frequently referred to during the recent committee investigation. It avoids the dangers of the Belleville, which arise partly from the fact that the water has a long and tortuous way to travel. The Belleville tubes are also difficult to clean, and a confined bubble may cause an explosion. The Yarrow boiler is the shape of the letter A with the bar in the middle left out. It is easy to clean, as the tubes are straight and nearly vertical, and the water has not far to travel. It is simplicity and safety combined, although our Government was slow to give it a trial. MODEL WORKS AND A MODEL EMPLOYER. Mr Yarrow has been a pioneer, an experimenter. All his life he has worked hard, inventing, designing, executing. When he started he was his own designer. He sat up late at night,, after his small staff left, working on his schemes. He has had to revise and reject his plans frequently, overcome disappointments ; but his final schemes have always succeeded. He has patented numerous inventions in connection with his business. He is still a diligent, quiet worker, gentle and unassuming manner— always on the best of terms with his men. Some of his assistants have been with him even since his early struggles. He has always enjoyed their esteem and even affection, as he is the kindest of men and most considerate of masters. 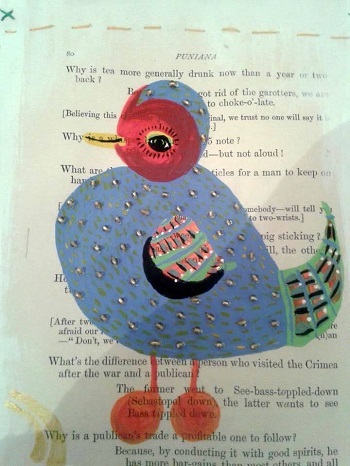 On going about his works he exchanges fraternal pinches of snuff with his assistants. He only just recently opened his new works, and brought his inventiveness to bear on their construction. He also copied the best things which he had found in American and other foreign works. The result is model workshops, where every mechanical contrivance has been introduced to save labour and increase efficiency, including hydraulic and magnetic lifts, electric cranes, pneumatic tools, etc. Mr Yarrow personally attaches little importance to his unique record. He says the number of firms who can enter the field of experimental work is very few. The great limited companies have little scope for risky enterprises. Their engineers must work for the shareholders, and not experiment with new inventions which may or may not be profitable. The Government has not encouraged research. The private firms who take a deep interest in research, and at the same time have the money to spend on it, are remarkably few. 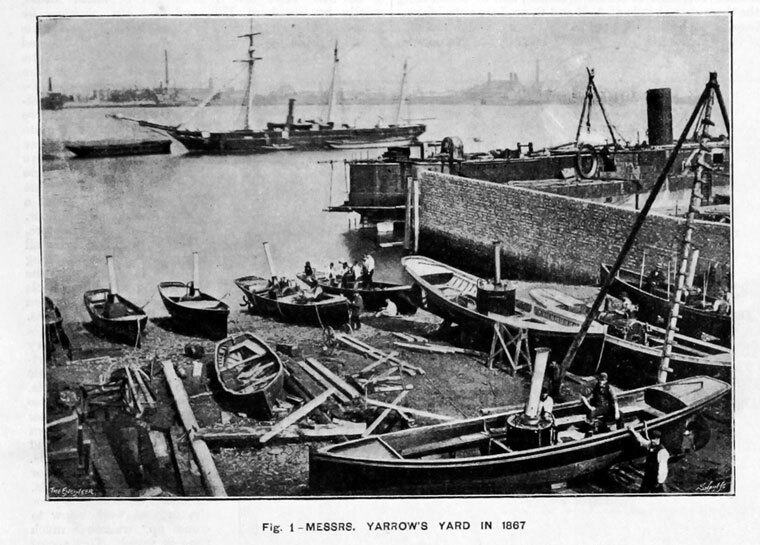 Mr Yarrow’s system has always been risky and speculative, but it has paid in the end, and he has won a unique international reputation as a marine engineer and naval architect, That is why his yard in the Isle of Dogs is visited by the naval experts from all over the world.— Daily Mail. 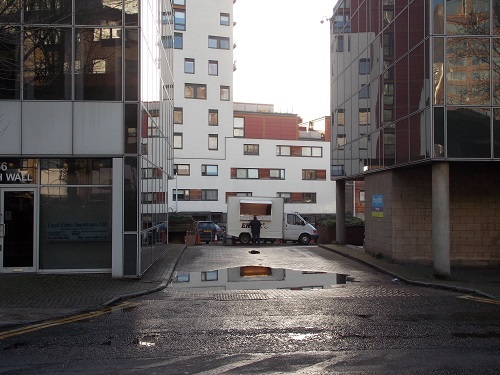 A few years after the newspaper visit, the decision was made to move to Scotland, Yarrow’s success meant it had outgrew its Isle of Dogs site. From 1906, most of the models and heavy machine tools was transferred by train to Scotland. The first vessel launched from the new works at Scotstoun was in 1908 and Yarrow’s became one of the world’s leading builders of destroyers and frigates. They also built a large number of merchant ships, still specialising on Riverboat vessels for the rivers and lakes of India, Africa and South America. After a series of takeovers Yarrow’s has become part of BAE Systems, in its history the firm has built thousands of ships and acquired a global reputation for quality. A remarkable outcome for a firm that started from humble beginnings in a small yard in Folly Wall on the Isle of Dogs. 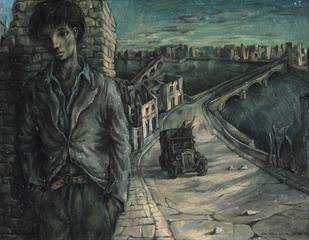 Whilst researching Wapping in the war recently I was side tracked by coming across the paintings of John Minton. 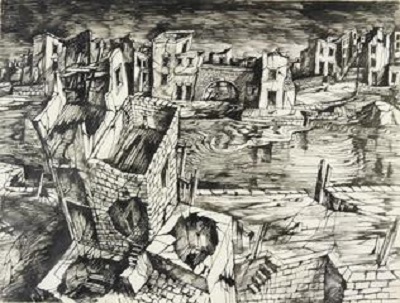 Unlike most of the Second World War paintings, Minton showed the effects of the bombing in a quite a strange way with usually one individual in a bombed out landscape. He produced a number of pictures of Wapping, Poplar and other parts of Dockland. 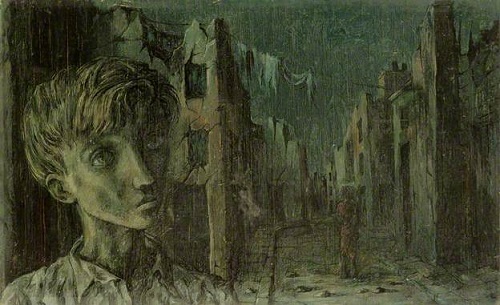 His ghostly figures seem to inhabit the strange wastelands of destruction and he tends to look down on the destroyed buildings from an aerial view. Minton was well known in the 1940s and early 50s as a painter, illustrator, stage designer and teacher. 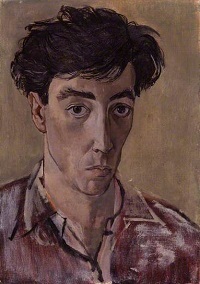 He studied art at St John’s Wood School of Art from 1935 to 1938 and was greatly influenced by his fellow student Michael Ayrton. 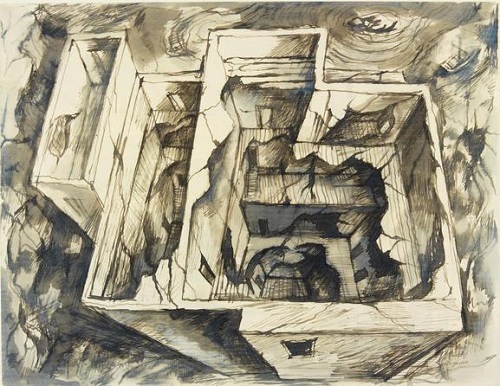 Minton and Ayrton, designed the costumes and scenery for John Gielgud’s acclaimed 1942 production of Macbeth. 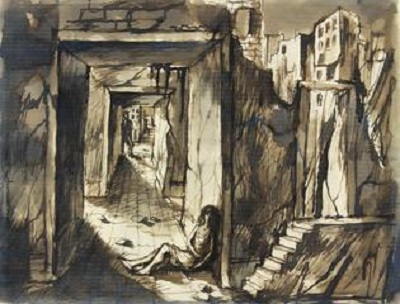 In the following year, Minton began teaching illustration at the Camberwell College of Arts, and from 1946 to 1948 he was in charge of drawing and illustration at the Central School of Art and Design. 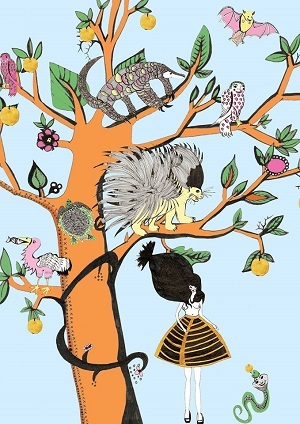 As well as his teaching, he produced a considerable body of work which included paintings, illustrations for Elizabeth David’s Mediterranean Food, he also designed posters and wallpapers. 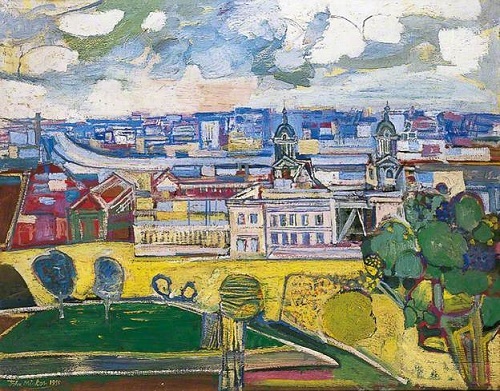 His drab and dark British painting were often in contrast to his bright and colourful paintings of scenes in the West Indies, Spain and Morocco. 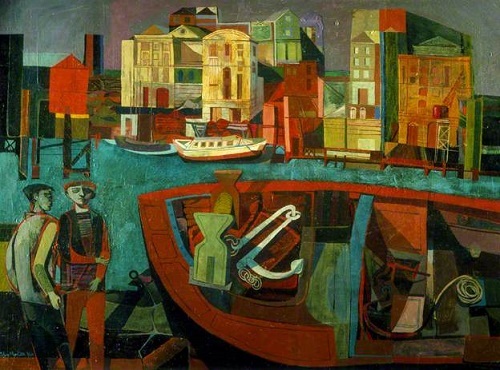 Although there were some notable exceptions in his Docklands paintings with colourful paintings of Rotherhithe and Greenwich. Unfortunately Minton’s success in the 1940s was not repeated in the 1950s and during that period he suffered psychological problems, had issues with alcohol abuse, and in 1957 he committed suicide. Tucked away behind some offices off Marsh Wall is a small white van dispensing food and drink to the office and construction workers. 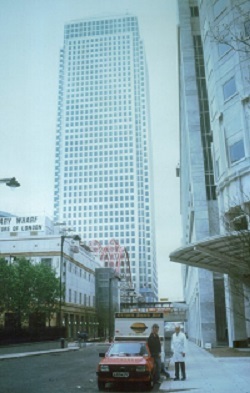 The van is located opposite the gleaming skyscrapers of Canary Wharf and few would realise the connection between the two. 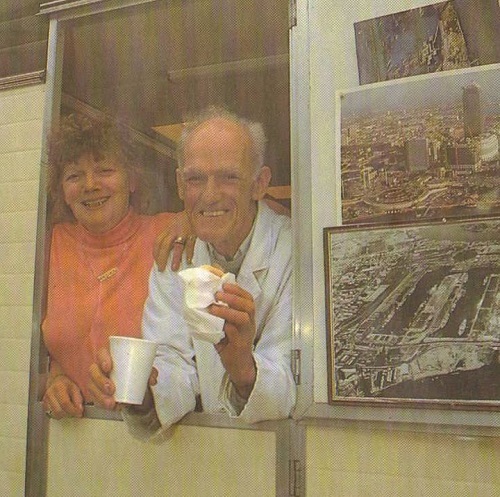 Remarkably Ernie Bennett who began Ernie’s Snack Bar was Canary Wharf’s first retailer, When Olympia and York started the Canary Wharf development, there was virtually no catering facilities nearby for refreshments. 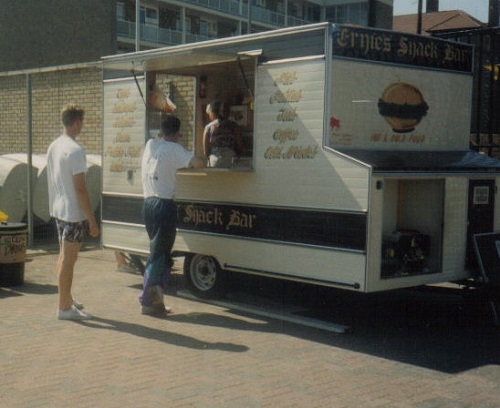 So Ernie moved his burger van to a pitch at Westferry Circus, and soon became a favourite with the construction workers providing tea and food. However it was not just the construction workers, in the early days of the London marathon, around the top of the course there were few catering outlets. 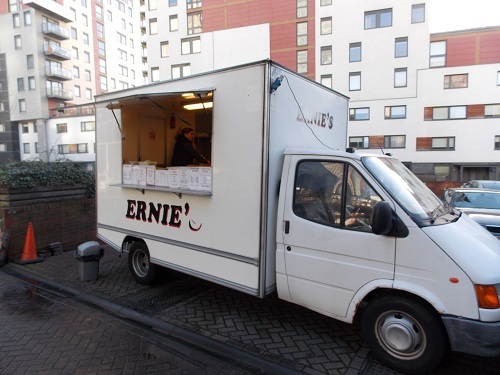 The developers asked Ernie to pitch his van just off Cabot Square. Ernie ‘s catering career started in the docks just after the war when he would provide tea for the dockers, however he then got a job with a clothing firm in the city for the next 30 years. 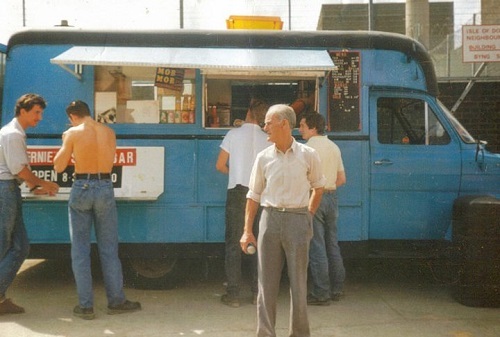 Although his original van was destroyed in a fire , that did not deter Ernie who bought a new one. Ernie was born in the Isle of Dogs and his family had lived on the Island since 1863, he was always proud of this heritage and in the windows of the new van he had pictures of the Island . 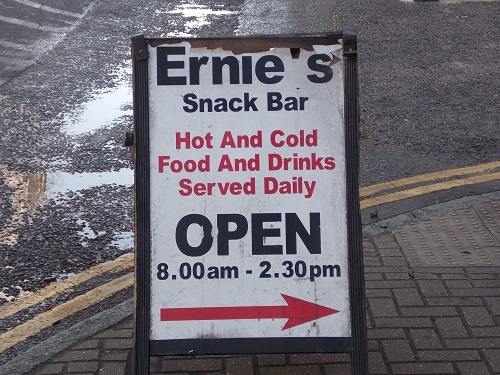 From a number of pitches around the Island, Ernie’s Snack Bar became a familiar sight , Ernie and his wife Doreen sold food and drink and built up a loyal following. 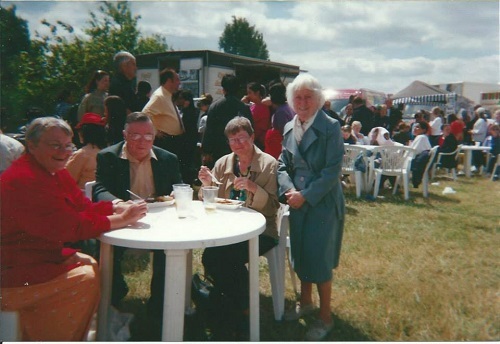 When Ernie passed away in the 1990s , Doreen and other members of the family have carried on the business. So if you are passing down Marsh Wall, you will most days see Ernie’s and Doreen’s daughter Sharon busy serving customers who little realise the intriguing history of Ernie’s Snack Bar. Many thanks to Sharon and Michael Bennett for the further information and the permission to use some of the photographs. Last year I featured the work of the talented local Illustrative artist Veronica Rowlands, her series of pictures entitled London Fashion Dolls and Surreal Doll Collection takes familiar and nostalgic dolls and transforms into something more surreal and fantastic . 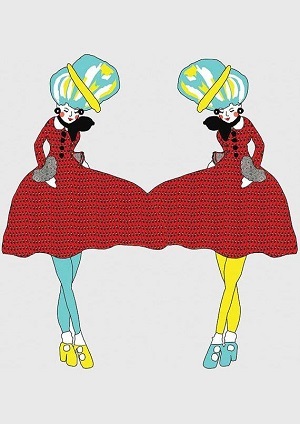 Over the next few weeks, Veronica will be holding an exhibition that will feature her fashion dolls but also her more recent ‘Interactive Wallpaper’ which has been created with members of the public across the city. 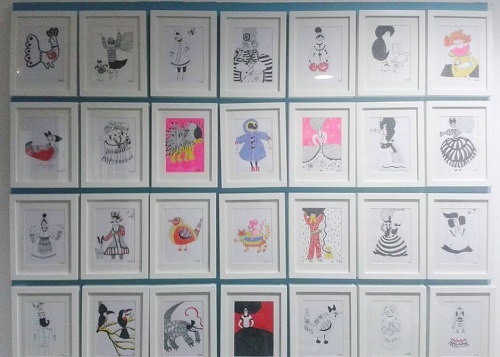 To produce this piece of work, Veronica has taken her hand drawn characters to venues across London and asked for help from people of all ages to colour them in , adding their unique hand writing to a piece of community artwork to raise awareness and funds for Beating Bowel Cancer and Breast Cancer Care. The wonderful and eclectic results will be shown in this exhibition alongside a solo exhibition of recent artworks with a percentage of all sales being split between the charities. 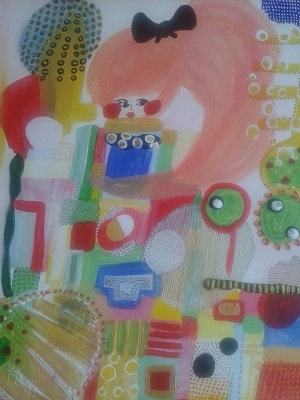 The launch of the exhibition will start with a Vintage themed Tea Party – with the opportunity to view & purchase affordable mini Artworks & greeting cards 3.30 – 5pm on Friday 6th February followed by the evening Private view at 6.30-9pm, the exhibition will continue until 3rd April 2015.